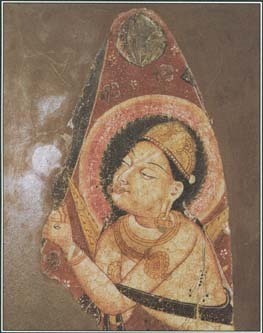 Indra was the ruler of the gods in early Hinduism. The son of the sky and the earth, he is a warrior god who protects people and animals and provides rain to water the land. In later Hindu texts Indra loses some of his power and his warrior characteristics. Other deities, such as Vishnu*, take his place as defender of gods and humans, while Indra continues to serve as the god of rain. Indra appears as a central figure in the Rig-Veda, an ancient Indian religious text, and its many stories involve Indra's fights with demons. In a famous myth, he faces a demon named Vritra, sometimes described as a dragon or serpent. Vritra had taken all the waters of the earth and placed them in a mountain where he remained on guard. In the devastating drought that followed, the people suffered greatly from thirst and famine. Indra decided to fight Vritra and rescue the waters from captivity. To prepare for battle, Indra drank a large quantity of an intoxicating beverage called soma that gave him enormous strength. Then he stormed the mountain and delivered a deadly wound to the demon with his thunderbolt. Vritra's death released the waters, which flowed down from the mountain to revive the people and the countryside. Some sources suggest that Indra's defeat of Vritra takes place again whenever strong winds and rains, such as those associated with a monsoon, arrive after a seasonal drought. Indra, a warrior god and the ruler of the gods in early Hindu myths, later became known as the god of rain. Legends about Indra describe him as riding either in a golden chariot pulled by two horses or mounted on a white elephant named Airavata. In addition to rainfall, a rainbow or the sound of a gathering storm indicates that he is present. See also Hinduism and Mythology ; Rig-Veda ; Vishnu .